One of the often-overlooked elements of the shot put is the preliminary movements at the back of the ring just before the glide. The execution of this phase can have a consequential influence on the rest of the throw. The shot should be positioned against the neck, under the jaw bone. In the hand it rests mainly on the upper area of the palm where calluses typically form from lifting weights. The fingers and thumb should be slightly spread and also in contact. It's also important that the hand is cocked back at the wrist joint. A cocked wrist preserves potential energy to be unleashed later during release. Starting with the feet side by side (support on both legs). Staggered -- Starting with the left leg behind (the left leg is also known as the free leg). The support leg (right leg) is under the hips. The "T" Position -- Right leg on the ground, and free leg up and nearly parallel to the ground. The torso is parallel to the ground as well. In all the above stances the hips are high from the ground with only a slight flexion in the support leg(s). The torso bends over and chest faces down, with the stomach close to -- or in light contact with -- the thigh of the support leg. At the same time the torso bends over, the knee of the free leg is drawn in next to the support leg. The bottom of the right foot stays flat on the ground for stability. The back is rounded off and relaxed and the head is down. The free arm (non-throwing arm) is relaxed and hangs down toward the ground with the hand fairly close to the ground. At the bottom of the crouch there is more flexion in the joints of the support leg(s) than in the starting stance. 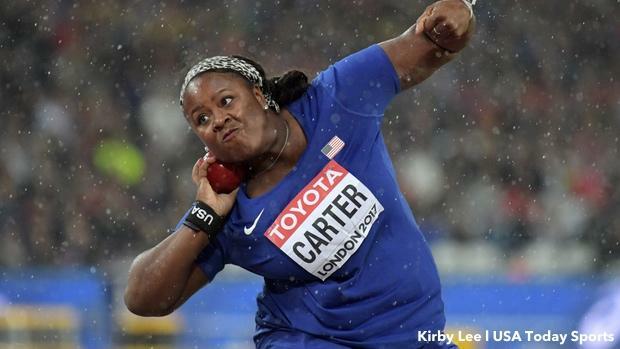 The amount of depth achieved is reliant upon the thrower's strength levels and proficiency in the event. One of the benefits of starting high and lowering into a crouch is the stretch reflex produced after such a movement. This is an extra and advantageous force which would not occur if starting the glide from a prolonged static crouch. Once the thrower hits the low point they're in a position to immediately blend into the glide. The glide should have a rather horizontal trajectory, leaving the ground from the right heel, with the left foot extending toward the toe board. Many times during the preliminary setup a glider will hike the elbow up excessively high in anticipation of the release. In doing so, they risk creating unwanted stress in the deltoid and elbow. They also risk a flat throwing angle where the forearm is too parallel to the ground. The elbow tends to rise naturally away from the body during the push of the shot anyway, so throwers may want to experiment with a more relaxed lower elbow position at the start, and test its effects on release angles. Robert Marchetti, a former NCAA Division I track coach at Rider University and Columbia University, is a private track and field coach located in Hamilton, New Jersey. For more information, you can email him at robertmarchetti221@hotmail.com. You can visit his website at www.coachup.com/coaches/robertm-4.